When you’re not making the progress you know you’re capable of, you have a choice to make: do you continue doing the same things you’ve always done, or do you try something new? I believe it’s important to investigate new ideas, and I’m going to conduct a social selling experiment that will accomplish that very thing. Today on The Sales Evangelist, I’ll share new ideas that have worked for me in the past, and I’ll explain how I’m going to put my reputation on the line to test it. Buyers aren’t looking for typical salespeople. The landscape has changed, and buyers are seeking sellers who will take the lead. They want sellers who solve problems and conduct business differently. The authors of the book Stop Selling & Start Leading compiled tons of research direct from buyers that helps sellers understand exactly what they’re looking for. The book is like a blueprint for sales professionals. At The Sales Evangelist, we’ve found the same thing. We’ve begun offering services in business development that allow us to develop business for our clients. We find the buyers and set the appointments, and we’re discovering that many companies aren’t doing business development well. We’re trying new strategies and exploring different possibilities to reach the prospects that can become long-term relationships. 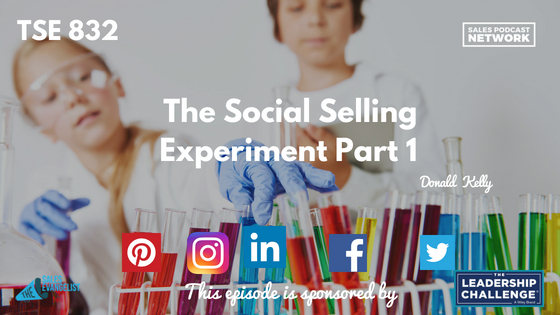 To demonstrate the power of it, we’re going to conduct a social selling experiment. We’ll connect with 20 people we’ve never done business with before using traditional techniques like phone and email. 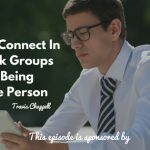 We’re also going to use social media to connect with 20 different people that we’ve never done business with before. For the social media group, we’ll develop a cadence model, and we’ll use LinkedIn, Twitter, Facebook, and Instagram to grab the attention of people and make them aware that we exist. I’ll invest 20 minutes each morning and 20 minutes each afternoon engaging with people on social media. As they respond throughout the day, I’ll also engage with them then. We know social selling works, and we want to demonstrate the results to you so you can see for yourself. We’ll evaluate at the end of the week which method produced the best results. 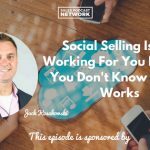 Many of us say we want to try social selling but we’re also afraid that we’ll mess up publicly. We can’t simply trust bots to make our connections for us, because people can see right through that method. Try one of our techniques and see how it works in your industry. Check in on The Sales Evangelizers on Facebook to follow our progress and interact with us as we conduct the experiment. We’re doing this experiment so you don’t have to. We’re putting our reputation on the line to demonstrate the value of trying new ideas to invigorate your sales pipeline. We want you to find more customers, build stronger value, close more deals, and do big things.